Hello from beautiful Cape Town! I’m here in South Africa for a week, working with Sundara’s partner, Eco Soap Bank. Last year our team had the opportunity to consult with Eco Soap Bank’s operation in Kigali, Rwanda, and this year I’m here helping them improve their Cape Town operations. Once I arrived in the “Mother City”, I got a tour of Eco Soap Bank’s partner and implementing organization, Baphumelele. This orphanage, hospice and care center is spearheaded by one of the most incredible women I’ve ever met: Rosie Mashale. This CNN hero affectionately goes by “Mama Rosie” and has been overseeing the center for 30 years. Many of the children she cares for are not only AIDS orphans, but are living with HIV/AIDS or tuberculosis themselves. Baphumelele is a light of hope in a very dark and difficult place. Eco Soap Bank (founded by another CNN hero and my dear friend Samir Lakhani) is working with Baphumelele in Khayelitsha, an informal settlement of nearly 1 million people 20 kilometers outside of Cape Town. Khayelitsha is currently afflicted by the largest HIV/AIDS epidemic in the world, with 33% of adults being HIV positive. One of the most affected populations are expectant mothers, where instance of the virus may be as high as 40%. On top of it all, the community suffers from one of the worst unemployment rates in the country, with 54% of adults lacking formal employment (some estimates put it even higher). With statistics like this, providing fair wage employment and hygiene basics like soap is a no-brainer. It makes me so grateful that organizations like Eco Soap Bank are here, investing in the success of Khayelitsha’s often forgotten residents. Over the next few days, I worked with Baphumelele’s senior management (Rosie, Bukhosi, Owen and Noah) and their staff to understand how to best improve various aspects of their soap recycling operations. One day was focused on the soap manufacturing process, another on hospitality management, and another on team dynamics and morale. 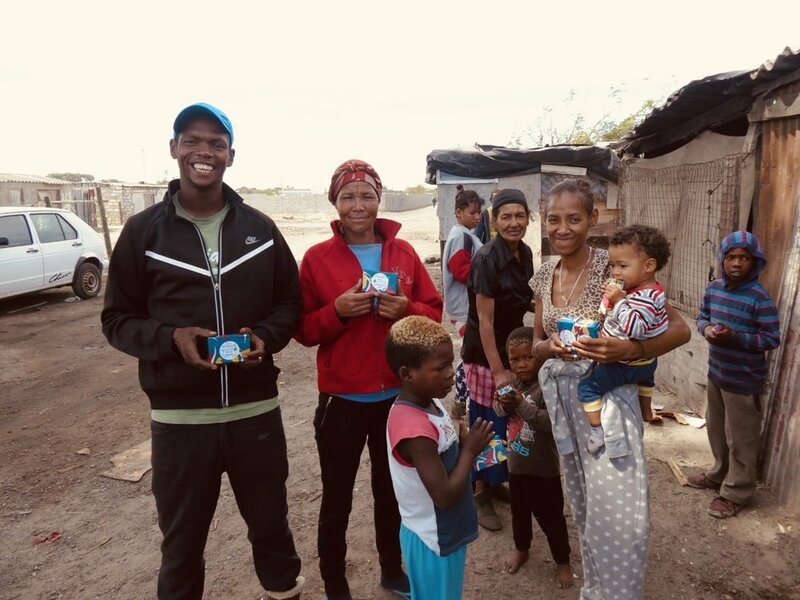 We wrapped up the week by discussing soap storage and packaging options, and on my final day, we held a soap distribution in a nearby township. One of the highlights of this visit was being able to spend one-on-one time with each member of the soap recycling team, hearing their stories and understanding why they are committed to this work. It was great to sit with the women to listen to their hopes and dreams. We also shared emotional moments, when the staff would tearfully describe their struggles and frustrations everyday living in Khayelitsha. Every woman this center employs is either a single mother or has a husband who is unable to find work. As a woman living in America without the financial responsibility of children to support, I couldn’t help but to be aware of the many privileges I was born into. If not for a stroke of luck, their stories could’ve been mine. Another highlight was getting to work with Owen and Noah – two talented, motivated men who run Baphumelele’s Fountain of Hope team. These two are passionate about fixing Khayelitsha’s high unemployment rate by giving teens the skills and motivation they need to find jobs and provide for themselves. Together, we met with local hotels to explain our process. It was such a joy to hear how easily they were able to convince members of their own community to invest in this soap recycling program’s success. Anyone who visits Cape Town will tell you it is one of the most beautiful places in the world – where the mountains fall right next to the ocean, the vineyards look like they’ve been painted, and the views from every drive take your breath away. Yet, if you look beyond Table Mountain, you’ll see townships gripped by decades of injustice, backbreaking poverty and extreme suffering. It’s a land of extreme contrasts. It was an honor to be a part of Eco Soap Bank and Baphumele’s work, even if only for a short amount of time. After spending time with their capable and motivated staff, I have no doubt that ESB’s Cape Town operation will continue to grow and succeed, providing Khayelitsha’s residents with job opportunities and the ability to live clean and dignified lives. If you would like to learn more about Baphumelele, please visit their website here. If you would like to learn more about our partner, Eco Soap Bank, please visit their website here.